Oct. to Mar. : noon to 5 p.m., Apr. to Sep.: noon to 6 p.m.Oct. to Mar. : noon to 5 p.m.
Apr. to Sep.: noon to 6 p.m. In the Ginza area, you cannot stop taxis outside taxi stands between 10:00 p.m. and 1:00 a.m. the next day on weekdays (not including Saturdays, Sundays, and holidays). The taxi stands are as follows (general taxi stands). Stands No.1, No.4 and No.11 are “Prime Taxi Stands”, where only taxis recognized for their safety and service quality are allowed to park. Ginza Sta. Ginza itchome Sta. Higashi-ginza Sta. Higashi-ginza Sta. 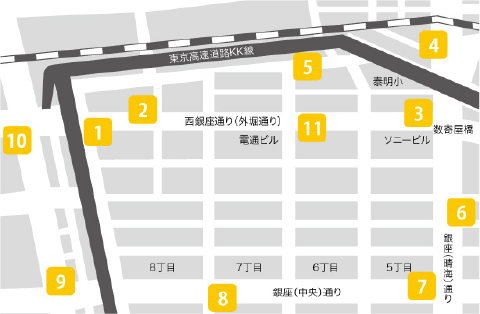 Click here to find parking lots in the Ginza area. Bicycles must generally be ridden on on the road. In Ginza, bicycles are prohibited from riding on the Ginza-dori (Chuo-dori) sidewalks or vehicle-free promenade (when open). (1) There is a sign on the sidewalk that says bicycles may be ridden on that sidewalk. (2) Bicycles being ridden by those under 13, 70 or over, or who are physically impaired. (3) Bicycles cannot be ridden on the left side of the road because of construction work, separately parked vehicles, or other obstacles. In any of the above cases, priority is always given to pedestrians. We appreciate your cooperation in ensuring all people of any age or gender may safely enjoy visiting Ginza.